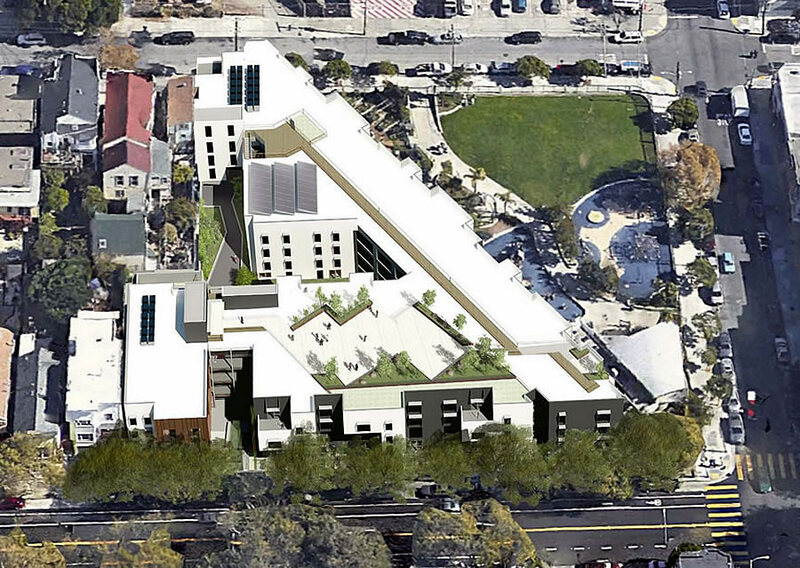 While approved for the development of 117 apartments last year, including 23 units which are to be provided at below market rates (BMRs), the 2675 Folsom Street project has been waylaid by appeals championed by Calle 24 Latino Cultural District and the Mission Economic Development Agency (MEDA). But with the development team having agreed to buy two four-unit rent-controlled buildings which were on the market in the Mission and transfer them to a neighborhood nonprofit, committing to using 100 percent union labor, and leasing 5,200 square feet of the development’s street-level space to a local arts organization for $1 a year, the groups have now agreed to drop their formal opposition to the project and allow the development to proceed as previously approved. The processing of the demolition and building permits for the former Charyn’s restaurant supply and auction house site, which has been boarded up for months, has been on hold pending the appeals. Now, that was clever negotiation. Good for Calle 24 and MEDA. Now, it’s a win-win, in the truest of senses—what all neighborhood development efforts should be about. Agree, this looks like a good result. Win-win? This would be a ‘win-win’ if the project hadn’t originally been approved or was seeking a variance or up-zoning. Instead, the production of housing was delayed, MEDA was enriched and the developer was extorted. You are out of your damn mind if you think that supporting extortion is a fair trade for the hope of preserving cultural plurality or embracing the arts. I completely agree that negotiations between developers and neighborhoods are an important aspect of progress, but not when throwing a fit is followed by a having a check cut (or discounts or land acquisition or etc) is considered a positive outcome. Let’s see how (if) that 5,200 sf is used before you claim victory. Just another community group shaking down developers for something which will only drive up the housing costs even more. Not poor developer….poor home buyers and market rate tenants , who now pay the tab for this extortion. I disagree. I’m not crazy about Calle 24, but this is a good result for our neighborhood. Having such a dedication to the Arts for the ground floor will also be an excellent addition. Now we have to speculate who this organization might be – Southern Exposure perhaps? maybe the art studio across the street would be interested! When your private acts impact a community, you should expect to have to mitigate such result or accept that you not be allowed to peruse your interests. By that “logic”, every company doing anything anywhere should be making shakedown payments to every 2-bit “activist” hustler who knocks on their door. Sorry “mitigation” payments. I don’t disagree that negative impacts from developments need to be mitigated by the developers, but the way to do this should be through the laws such as required affordable units included with the project, developer fees paid (which the city/county or passed propositions can dedicate to arts, transportation etc.). When you have an appeals process that allow special interest groups to hold up projects and then receive a ransom to release same, the system isn’t working IMO. The development by itself was a positive for the community. They were already providing 23 BMR units that did not exist before. Everything after that was purely greed by Calle 24. Their private acts negatively impact the community. I agree the proposed development is a positive (which I’m glad should now proceed), but also posed negative consequences for the existing community. Preserving 8 households as bulwark against displacement is an undeniable positive. Without the statute before me, it’s hard to say whether the language clearly precludes a reading of something so “ephemeral” as gentrification as coming within the ambit of the kind of impacts addressed by CEQA as first raised in the Miller Electric property but it’s an interesting question. The ad hoc resolutions being worked out are IMO preferable to litigating the issue. How long do you need to have lived in the Mission before you qualify as “existing” and do you have to be of a certain race, and income bracket, what is the cut off? Sounds like totalitarianism to me. “existing” — that which is there, including people and properties. Sounds pretty simple. If I am a techie that moved to SF and into my brand new condo in the Mission circa 2013, seems like I qualify under “that which is there”, but I don’t see how this project is going to have a negative impact on me, please explain. Does MEDA and 24 really represent the “community’?? They sure didn’t represent me when I lived in the Mission. I was the wrong skin color and class. Hard to see this as a win when you consider the second-order effects. 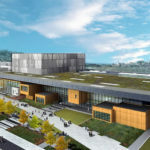 This has already been delayed 10 months, and we know the cost added by such delays is a main reason more projects aren’t proposed – projects that would likely add many more BMR units than the 8 preserved here. Project-by-project negotiation, unless the developer were asking for something extra, is a losing strategy. Feels like this sort of deal should be illegal. I wish I ran a nonprofit that paid me a huge salary and owned San Francisco real estate. Sweet deal. This is par for the course. Labor has long fought tooth-and-nail against sensible CEQA reforms, because they use CEQA suits as leverage to secure union-labor concessions. * = organization handpicked by MEDA and thus creating the equally-slimy nonprofit blackmarket for arts organizations. only the Old Ones survive. new artists stand no chance, becase MEDA et al oppose growing the market-rate stock of arts space. if you’re a young artist, these mission nonprofits are you enemy. move elsewhere. *=You forgot to point out that the executive director of whatever group moves in will be a member or a close friend of MEDA. Gotta love it when people complain that they’re disenfranchised because businesses are not moving into their neighborhood, then claim that they’re disenfranchised because businesses ARE moving into their neighborhood. Perpetual victimhood at its finest. Unfortunate that this was allowed to happen and will only encourage special interest groups to continue with their tirades. Back doors like this should not exist for approved projects. Posted by Do something about it! This isn’t an isolated occurrence here in the city. Just read out the Parcel T DR. Instead of ranting on raving about it on Socketsite, lobby your supervisor for reform! Yeah! Bullying and Extortion Pays! “…if affordable housing isn’t an option, then what? Arguello from Calle 24 reiterated his alternative suggestion, namely that the developers build a parking structure instead of housing. 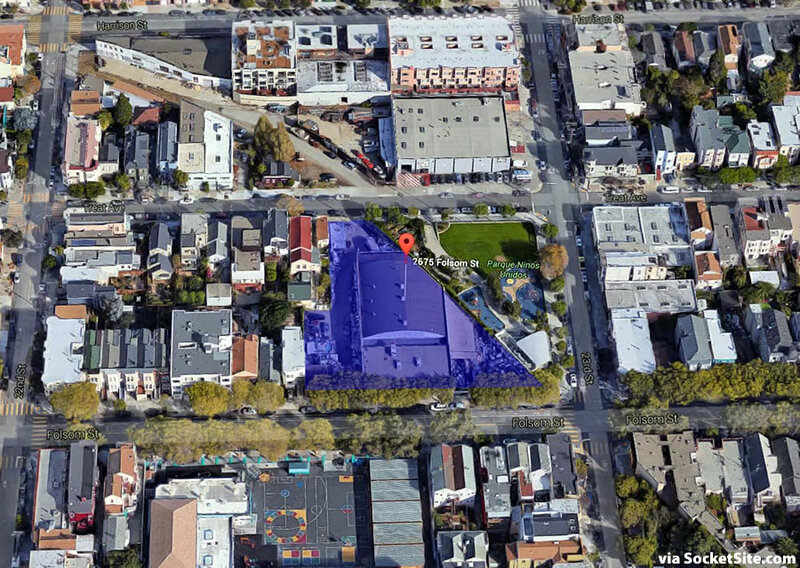 Weisbach said the city had rejected that idea outright; Arguello said in his conversations with officials, it seemed doable, because the area is part of the Latino Cultural District. The cultural district should be entirely ceremonial, without any influence on city planning. A parking structure? How is that “progressive” in any way? What benefit will parking provide for low income local residents anyway? 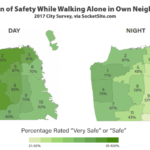 Doesn’t the City want to discourage more car use, especially in an ultra-dense neighborhood like the Mission? Not that I support the parking structure idea, but as I understand it, many Latinos who were long-since priced out of the Mission still drive in from far-flung places throughout the Bay Area to experience the shops and culture. Maybe his thinking is to facilitate that. Can someone put a dollar amount on what was provided by the developer? Laughable shakedown. The mission is a joke.